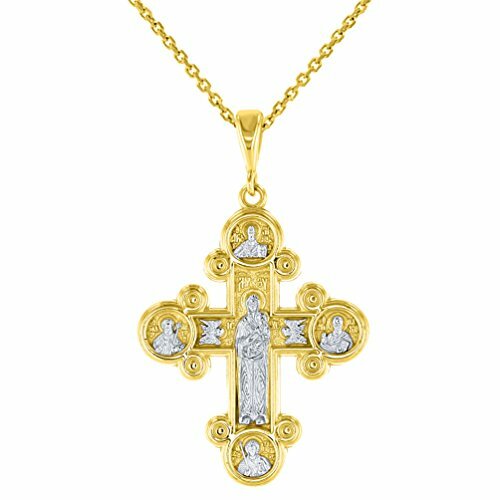 Solid 14k Gold Orthodox Cross Pendant depicts Virgin Mary the Mother of Jesus Christ and four Saints. This handmade Holy Theotokos Cross Necklace is perfect for any occasion. Order this today or browse our unique, trendsetting, & affordable fine gold jewelry. Solid 10k White Gold Catholic Jesus Christ on INRI Cross Crucifix Pendant Necklace (1.6"), 22"
14K Yellow Gold Filigree Hamsa Hand of Fatima Charm Pendant Necklace, 16"
10k Rose Gold Prayer Hands With Prayer Beads Charm Pendant Necklace, 20"
Solid 14K Yellow Gold Plain and Simple Cross Charm Pendant Necklace, 22"
Solid 14K White Gold Roman Catholic Open Cross Crucifix with Jesus Christ Pendant Necklace, 16"
Polished 14K Yellow Gold Anchor Charm with Mariner's Cross Nautical Pendant Necklace, 16"